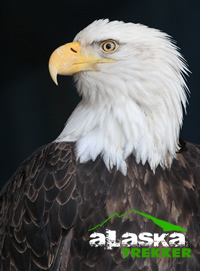 A magnificent and majestic bird, bald eagles can weigh up to 14 pounds and attain a height of 3 to 3 1/2 feet. They have a huge wing span of 6-8 feet. Typically, the female of the species is larger that the male and bald eagles living in the north are believed to be larger than ones in the south. Bald eagles can live up to 30 years in the wild and even longer in captivity. Bald eagles were on the brink of extinction in the USA late in the 20th century, but now has a stable population and is in the process of being removed from the U.S. federal government’s list of endangered species. The bald eagle is an opportunistic feeder which subsists mainly on fish, which it swoops down and snatches from the water with its talons. It builds the largest nest of any North American bird and the largest tree nests ever recorded for any animal species, up to 13 feet deep, 8.2 feet wide, and 1 ton in weight. Officially adopted as the United States’ national emblem in June 1782, the Bald eagle is a proud, majestic, and handsome looking creature. 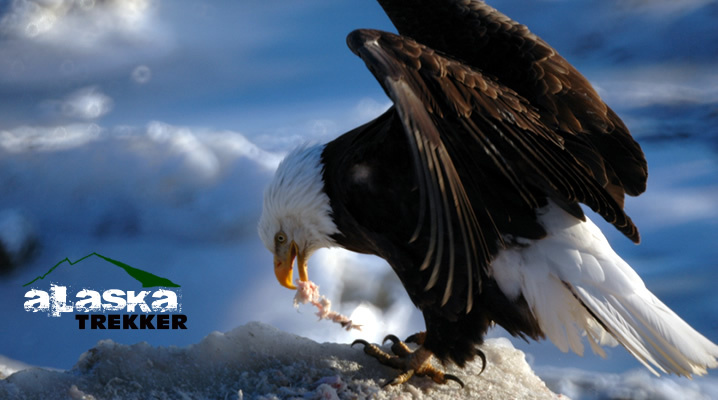 The Bald eagle inhabits coastal areas, as well as forest, mountain, lake, valley and river areas throughout Canada, Alaska and the United States. Between 80,000 and 110,000 Bald eagles live in the wild; however, there are a variety of threats that face these beautiful creatures, such as PCB poisoning, shooting in order for mankind to lay his hands on their feathers, and loss of their homes due to developments in the coastal areas. In 1995, the Bald eagle – which used to be classified as endangered – was categorized as a threatened species. In the wild, these stunning creatures can live for thirty years or more, and the average life span is even longer for those living in captivity. The while coloring of the head is what gives the Bald eagle its name, and for most people the name is now synonymous with enormous strength, agility, and power. Averaging forty miles per hour in flight, the Bald eagle has a six to eight feet wingspan and a body length of 32-40 inches. In general the female Bald eagle is larger than the male, but both genders are impressive in appearance, agility, and strength. The powerful talons of the Bald eagle help these creatures to catch and kill prey. The Bald eagle is adept at swooping down and catching prey in the powerful grip of its crushing talons, and its hawked beak is ideal for tearing the prey apart for consumption. These creatures live on a diet of fish, waterfowl, and small mammals. The mating of Bald eagles is a long term affair in most cases, and their union is one that last forever. The female Bald eagle lays two eggs during the spring, which hatch after around five weeks. The more aggressive and dominant of the two hatched chicks is the one that tends to survive in most cases – it really is the survival of the fittest. The young Bald eagle barely reaches four months of age before leaving the nest forever. The next of the Bald eagle is an elaborate affair, and can reach as much as five feet across and weight several thousand pounds. The parents build the next in the branches of tall trees, and every year they add to the nests with fresh sticks and moss. Bald eagles have around 7000 keratin feathers, which are used to trap air and insulate the Bald eagles against the dangers of the cold and rain. The beautiful feather and both soft and strong, and sadly have contribute at least partly to the decline in the Bald eagle population, as man has hunted this stunning creature in order to take its feathers. The eyesight of the Bald eagle is excellent. These creatures can see fish several hundred feet below the surface of the water, hence hunting is not as difficult for these birds as it is for some other creatures. Their eyes are also designed to enable them to see in front of them and to the side of them simultaneously. When migrating, the younger Bald eagles actually migrate before their parents, although it is a mystery as to how they know when the time has come or where they are supposed to go. 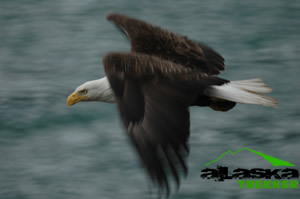 The adults that do decide to migrate (not all Bald eagles do this) then follow on later. When migrating, these creatures tend to go wherever food and water is likely to be available, and using their powerful wings they fly and glide to find fresh waters and prey. The bald eagle is found throughout most of the continental United States, with Alaska alone having half of the world’s total bald eagle population of about 75,000 birds. The ideal habitat of the bald eagle is places which are isolated, have big full grown trees and clean, clear waters with an abundance of aquatic animals and fish. Needless to say, Alaska is the perfect place for an eagle.